I have been playing around with Google Buzz. And I thought I would write a blog post about it. It is only a few days old now but I have found a number of neat things using this service. First, It is not your dad's twitter, It is new and fresh and the location embedded messages are killer. This example to the left is a guy stuck on the bridge at 1am when the draw bridge went up. You just don't have anything this neat with Twitter. Google took foursquare and twitter and killed them. Try browsing around the map which has the Buzz bubbles on them. 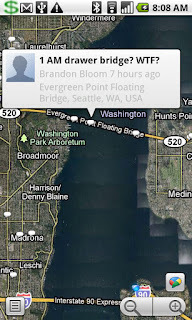 To enable this, go into your Google Map on your phone. Make sure you have version 4 or greater installed. Enable the Buzz Layer and then you should see all the blips appear. I browsed around Costco and I saw plenty of people talking about getting a hot dog. It give me a lot of good feelings to see actual speech bubbles coming from the places. It is like the map is alive and telling what is happening. This is far better reporting because you have so many spots. I could see something like this being used at sporting events or during a crisis. Here is my bubble coming from my house. I took a picture out the window to show how good the geo-coding is. 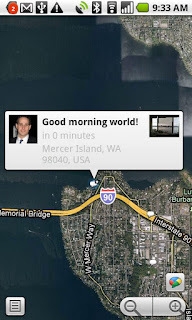 I am really looking forward to the API that Google releases, there are so many possible ways to use this application. I really do feel sorry for twitter. They should have sold last year when they were still sort of fresh and new. I might be accused of being a Google Fan Boy, but I just like the products and culture that Google has. They took their time to pick on Twitter, but when they did, they nailed it. I can only imagine that Microsoft is going to try and copy this and twitter will have one last chance to sell. What are your thoughts on Google Buzz? If you currently Tweet, do you think you will Buzz? I think the answer is yes. If people are on the fence there is an option to pull your twitter stream into buzz as well. So Google has the perfect way to incorporate all the twitter messages from the people that are on the still using Twitter. Why no more posts since Feb?